Women’s voice and agency are essential for the governance of natural resources because of their diverse experiences as farmers, fishers, household providers, and entrepreneurs. However, their perspectives are often unrecognized and their needs unmet in shaping and applying environmental policy. Ensuring that gender perspectives and women’s knowledge, needs, and capacities inform sound policy making is critical to achieving sustainable livelihoods and sustainable development. 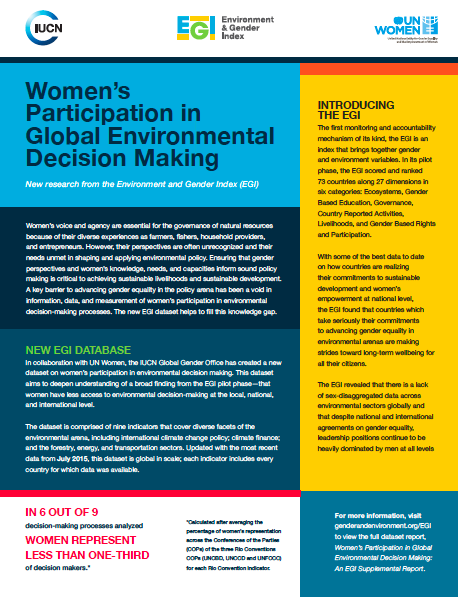 A key barrier to advancing gender equality in the policy arena has been a void in information, data, and measurement of women’s participation in environmental decision-making processes. The new EGI dataset helps to fill this knowledge gap.